 A challenging, if not always thorough, reminder that middle- class blacks face accumulated experiences of racism too often ignored by the majority culture and scholars of race relations. Complementing and overlapping Ellis Cose's The Rage of a Privileged Class (not reviewed), this book offers a broader sample and more theoretical grounding but less of a narrative voice. The authors announce at the outset their disagreement with less liberal commentators ranging from Daniel Patrick Moynihan to Stephen Carter for emphasizing the so-called black underclass over the widespread experience of racism. Feagin (Sociology/Univ. of Florida) and Sikes, a consultant and antiracism workshop leader, have compiled the results of interviews with 209 middle-class African-Americans. The litany is disturbing. Interviewees tell of being refused service or treated with suspicion in restaurants and other public places. Their children are ``tracked'' into vocational subjects and are more likely to be suspended for subjective offenses like disobedience. 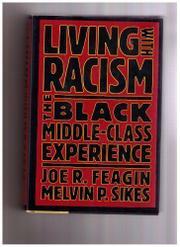 In the workplace, as one interviewee explains, ``blacks in the company had jobs, and whites had careers.'' The authors discuss discrimination against black business owners and home buyers and reveal survival strategies ranging from institutional confrontation to humor. They conclude that Americans must do more to confront the reality of white racism and support better education about racism for children black and white. But their assessment, for example, of racism on campus is hardly complete, blaming white students and campus culture without sufficiently analyzing the issues of self-segregation and Afrocentrism. Nor do they fully address the effects, both good and bad, of the recent trend toward corporate ``diversity training.'' A worthwhile entry into current discussions of race relations, though it requires a dollop of skepticism.